This smooth-as-silk fall soup is creamy, dreamy, and full of flavor despite its short list of ingredients. I didn’t come to appreciate winter squash until later in life. Not that I really remember being served it much as a kid – but if I had been, I wouldn’t have touched the stuff. The closest thing I remember regularly encountering was that marshmallow-topped sweet potato casserole served at Thanksgiving, which isn’t even squash, but in my mind they were one and the same – orange, mushy, and no thank you. In adulthood, I expanded my palate in many ways, though I was still a late squash adopter. Names like “butternut” and “spaghetti squash” drew me in, but were disappointments at first. Butternut squash tasted neither like butter or like nuts; spaghetti squash was most definitely not pasta. Luckily, I kept at it, and now I’m a convert. 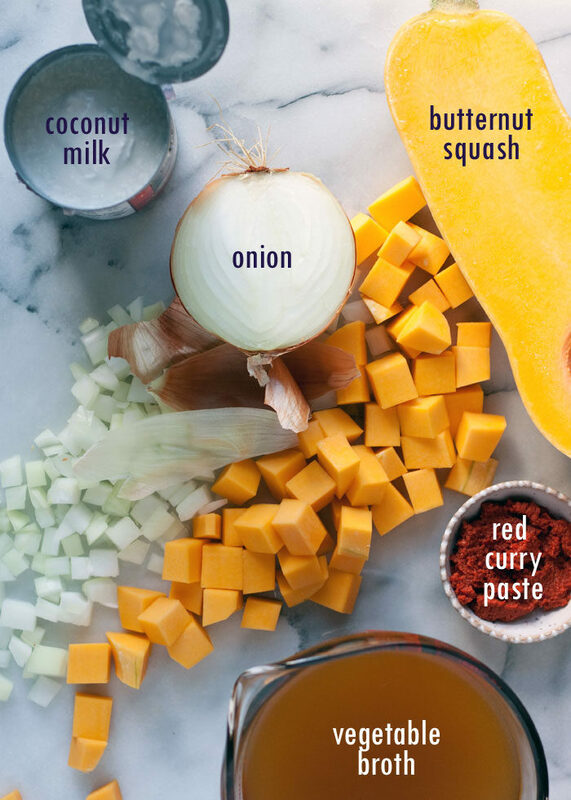 Butternut squash, especially roasted or pureed into soups like it is in this Slow Cooker 5-Ingredient Thai Curry Butternut Squash Soup, is one of my very favorite fall foods. And thank goodness for that, because I was missing out. This time of year, I can’t help but pick up a squash or two every time I shop for groceries. So this beautiful butternut sat aimlessly on my kitchen counter for a bit, until one morning, I decided it needed to become soup for dinner that night. I chopped it up, added veggie broth, an onion, and some salt, and let it simmer all day in the Crock Pot. A quick puree, a generous scoop of Thai red curry paste, a can of coconut milk and dinner was on the table. I love simple recipes like this! 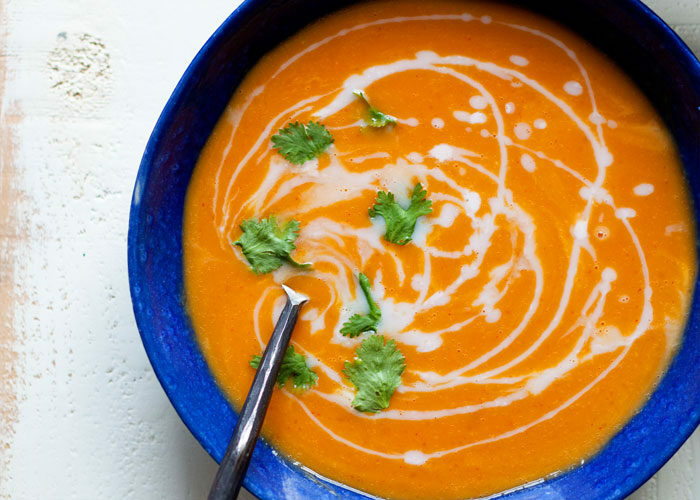 The butternut squash is smooth and creamy; the Thai red curry imparts a ton of flavor and a touch of heat that keep this soup nice and interesting considering how truly simple it is. No marshmallows in sight. Place butternut squash, onion, broth, and 1/2 teaspoon salt in your slow cooker. Cook on low for 8-10 hours, or on high for 4-6 hours. Remove the lid and let the soup cool a bit before pureeing. When cool enough to handle, carefully puree the entire batch right in the slow cooker with an immersion blender. 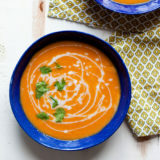 You can also use a blender, working in batches, then return the soup to the slow cooker. Stir in the coconut milk and the Thai red curry paste. Cover with the lid and cook on low for another 30 minutes or so to heat the soup back up. Taste and add additional curry paste and salt if desired. Serve alone or with optional toppings. 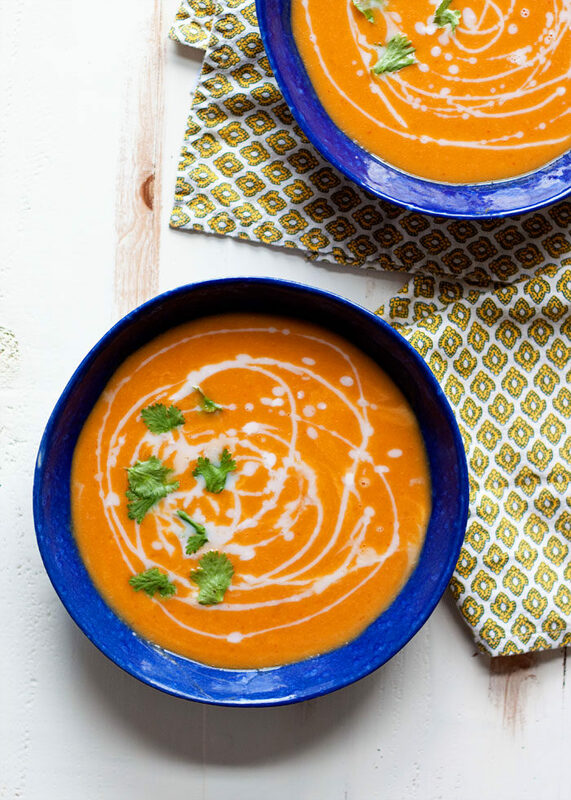 5-Ingredient Roasted Carrot Ginger Soup – so easy and full of so much flavor. Simple Lentil Vegetable Soup – a seriously satisfying bowlful. 25-Minute Comforting Vegetable Soup – love how quickly this one comes together. Chickpea & Rice Soup – even chicken lovers love this one. Bean without Bacon Soup – reminds me of the childhood classic, but, of course, no bacon! This looks so good! I love soups made with coconut milk, it adds such nice sweetness and creaminess. How spicy is it with the red curry paste? I love spicy foods but one of my daughters really does not. How do you think this would taste with granny smith apple cubes added at the very end of cooking? Thanks for any guidance! Hi Lauren, surprisingly, the Thai red curry paste does not add that much heat. The nice thing about adding it at the end is that you can really adjust to taste. Start with 1 tablespoon and taste and see how you like it, then go from there. I think a granny smith would be awesome in this, even if it was added at the beginning of the process and pureed in. Thank you! 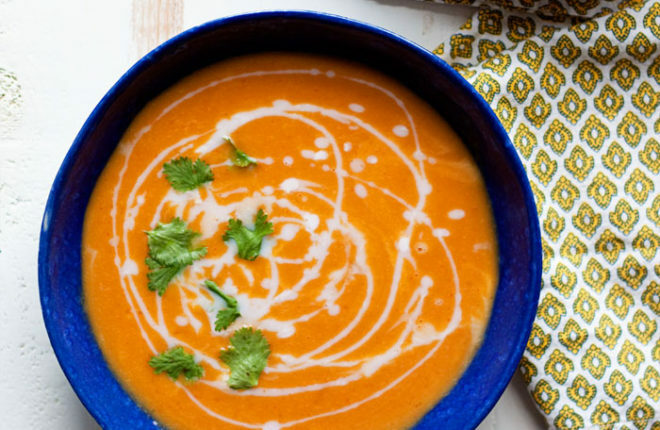 I am really looking forward to trying this recipe, especially since I found out that my 14 year old son was having a conversation with his buddies in the cafeteria about how much they love butternut squash soup! Who knew boys would talk about healthy foods at the lunch table?! I just made this soup today! I love it and so does my boyfriend. I used with 4 tbsp of massaman curry paste because I had it on hand and topped with crispy fried shallots. Yay! Glad you liked it! Hi! I’m currently cooking this right night, so excited to try it. Can you recommend any side dishes to go along with it? Hi Amanda, we like a simple mixed green salad alongside! So…. how would the taste of this be altered if, say, someone didn’t read the entire recipe before starting, and put all the ingredients in the crockpot at the same time? I was rushing this morning and made this mistake, and the coconut milk and red curry have been in the pot all day. Will I need to add more coconut milk later? It doesn’t look too creamy right now. Hi Elle, I’m late in responding so you probably have your answer by now! I’ve made it with the Thai red curry added up front, and I found that the flavors were just a little muted and the heat not as pronounced. As far as adding the coconut milk up front, it may have scorched and added a strange taste. Or it may have been fine! 🙂 Report back if you can! It looked a bit watery at the end of the day, so before I even tasted (my mistake), I added a second can of coconut milk. It still tasted delicious! Next time I’ll try to leave the milk out until the end, though. Made this last weekend, and it was so easy and really good! Would this soup be freezable? Just realized I bought spaghetti squash instead of butternut! Do you think it will work? Thanks. Yummy! I liked this! Simple and so easy.